A friend of mine was stationed briefly at Fort Ord during the Viet Nam war. 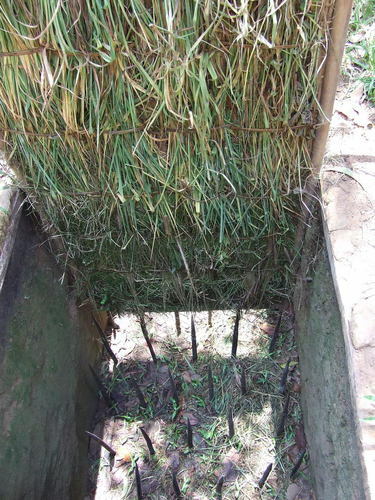 He was taught that the Viet Cong would make traps, and dig pits with sharpened and poisoned sticks in them to injure the soldier, but not kill him instantly. They sharpened sticks to pierce his feet or body. The poison would get into his blood and bring slow death. Punji stakes are a soldier’s nightmare. They are set precisely to cause great pain. 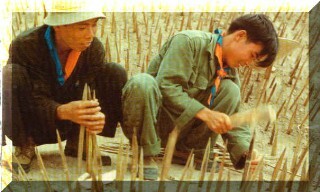 They are carefully sharpened bamboo sticks positioned behind logs that GI’s step must over. Sometimes they are spread across entire fields. “Charlie” would rather wound with “Punji” stakes dipped in a special excrement brew. He would rather cause a slow painful death. He knew that it takes more men to care for a wounded soldier and give him back his health than to care for a dead one. The reason they wanted to injure and not kill, was if a soldier was injured, the US Army had to stop fighting long enough to care for the wounded. If enough get wounded, others have to stop fighting to tend to them. The enemy of our soul thinks the same way too! We all know some that have been wounded by horrible life experiences, addictions, unkind comments and the actions of others. We stop fighting the enemy momentarily, and concern ourselves with the injuries and injustices done to those we love and know. Our heart aches for their pain. We do our best to help. But never fail to recognize the strategy of the enemy. We are not ignorant of the enemy’s devices. He wishes to distract us all. He wants us to focus on ourselves, our injury, our pain, our loss. I have great sympathy for the injury of others. I grieve for them, I too am aware that we can only focus just so long on “us”, because there’s still a battle to be fought. I’m so sorry for those that have been injured. My advice to us all, is “Let’s don’t lay our weapons down, let’s keep fighting, regardless! The battle is not over yet! I was a soldier and was taught this principle and the ironic thing about your blog entry–I had recently felt a need to write basically the same thing!!! Thank you very much for this post…just read this a couple days ago and I relate yo one of my Christian friend…just today we received heart melting news about our sisters in Christ…and my friend remind me of this…yes,the devil really wants yo stop us serving The Lord hurting our fellows so that we might keep thinking of them instead of continually praising and serving The Lord!God is soooooo good….so thankful for wonderful men of God….and for His annointing? I had been searching google for something on this topic and it finaly linked me to this after about 30 minutes of searching. An apostolic preachers blog!! I am an apostolic preacher and had felt led in this direction of thought for my church. My first inspiration was that it took “men” to bring a “man” to Jesus, (Luke 5), and four men, (Mark 2). I was wondering how many times people and their drama create such a distraction that more important things are left for illigetimate causes. It’s all about attention. Those without a purpose or focus from lack of a payer life and personal walk with God being inadvertently used by the devil.